I like my bananas a little on the green side. For more banana flavor use riper bananas. These are delicious with brown sugar, cinnamon and vanilla. Place bananas in a small microwave-safe bowl. Top with brown sugar, vanilla and cinnamon; dot with butter. Cover and microwave on high for 1-2 minutes or until sugar is melted, stirring once. 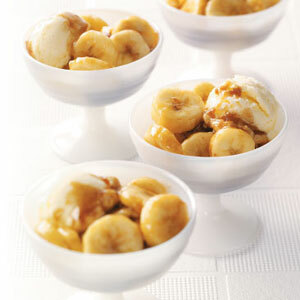 Spoon banana mixture into bowls; top with ice cream. Serve immediately. Yield: 4 servings.